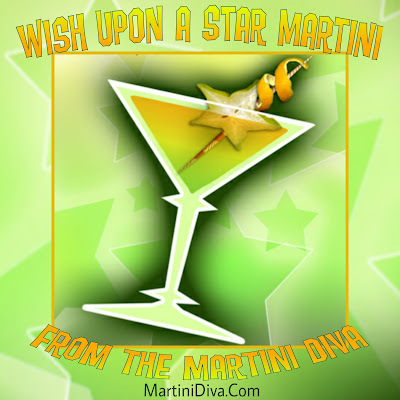 I had to do a special for Wish Upon a Star Day, held every July 17th, because my favorite song in the world is "When You Wish Upon A Star" from Walt Disney's Pinnochio. I would make free cocktails forever for Jiminy Cricket! 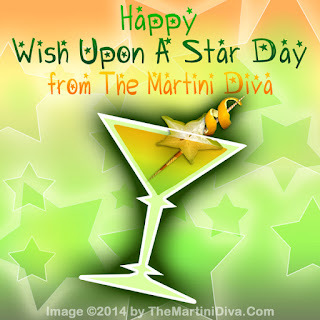 Why is July 17th Wish Upon a Star Day? Because it's the birthday of the original Disneyland, in Aneheim, which opened July 17th, 1955. I would also make free cocktails forever for Walt Disney, who happens to be one of the top inspirations for my art career. Directions: Slice off one section of the star fruit to get a star shaped slice for your garnish. Peel, deseed then puree the remainder and add it to your cocktail shaker with the rest of the ingredients. Blend until smooth, pour into the chilled glass garnish and serve. Star fruits, also known as Carambola, are native to Asia but are now being cultivated in many tropical locations. The whole fruit can be eaten, including the skin though the ribs are usually tough and better cut away. They are tart, sweet and very juicy and taste a little like apples and pears with an overtone of citrus. They are high in anti-oxidants, vitamin C and even have some antimicrobial benefits. BE AWARE: If you cannot have grapefruit because of certain medications, star fruit may also be counter-indicated for you as it has some of the same enzymes. Also star fruit contains oxalic acid which can be harmful for anyone with kidney disorders!